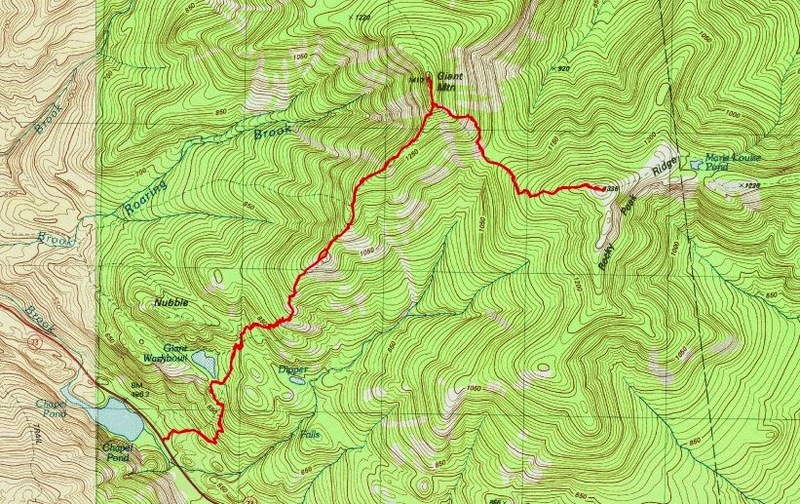 In picking a hike for today, Giant and Rocky Peak Ridge were the only peaks that I had in my head. I'm not sure why. Leesa wanted a hike that would be about 6 hours or so. I wanted to get some vertical and get perhaps one last good snowshoe hike for the season. I also wanted a trail that would be well broken, since I knew that with spring conditions, a trail not well broken would be much more difficult. I've done Giant and RPR many times before, in all kinds of weather. I've done them in conditions similar to today, and remembered the hike as a good one. On my own, I've done the pair in less than 5 hours, but Leesa and I were out to enjoy the day. Leesa's never one to go for speed. We arrived at the Zander Scott Trail and got started at 9 AM. It was 32 degrees. Since we were climbing the west side of the mountain, we were in the shade until we were 2/3 of the way up. As we got into the sunshine, the snow began to stick to our snowshoes. I knew it was going to get warmer, and as soon as it did, the snow would no longer stick. Two pairs of people had signed in ahead of us, one pair for Giant, and the other pair for both Giant and RPR. We saw both, as well as one other pair of hikers, all near the Giant/RPR split. Those were the only hikers we saw all day. We reached the summit of Giant at around 11:30 and there was practically no wind! That was a first for me. Needless to say, we stayed on the summit for awhile and enjoyed it. As we started towards Rocky Peak, the sun really began to bake us and the snow. The trees started to rain as their icicles began to melt. As the snow got softer, it no longer stuck to our snowshoes. We reached the icy step on the way down Giant and it was still mostly covered in snow. I broke out the Rev snacks on RPR and she was appreciative. Once again, we spent some time on the summit. RPR is one of my favorite high peaks and I always linger when I'm there. Leesa started back and I stayed just a little bit longer. I took a couple videos and a whole bunch of pictures. I finally had to say goodbye. I zoomed down towards the Giant/RPR col and caught Leesa at that point. From there, we began the steep climb back up Giant. It was tough in the hot sun and soft snow. I'm not used to hiking in the warm temps yet! Back at the Giant/Rocky split, it was all downhill from there. It was tricky though. I tried to stay upright descending the soft mushy snow. It was now almost a water slush slide. I did succumb twice to a lack of balance and ended up on the ground. Leesa took the buttslide approach, and I think she was more successful. We didn't reach the car until 4 PM, but it didn't matter. We had a good day. It was 46 degrees when we got back to the car, and 55 when we got home! Leesa stated that she is now ready for spring. I'll take it also, but winter hiking is still my favorite. I am ready for some bushwhacking though. I haven't done much since the snow began to pile up in February.